My feelings: Black's ladder breaker in fuseki was dubious. White got too much on the top (san+san and extension). 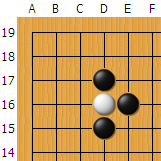 Later Black did not get enough compensation on the lower side by attacking White. Actually, it was hard to attack White's groups. The game was still close, but Black's yose was slack and the difference became close to 10 points. Taranu vs Mero Csaba semifinal game will be played tommorow. No date for representative deciding game yet. R13-S13-S14- there are some ladder-related patterns here. Ilya was unlucky this time. EGF decided to make the play-off between top 4 on EGC-2009. Can someone point out the ladder that K4 was intended to break? Why Ilya(roln111) do not participate?